TiMLiM's solo album project: December gigs! 'TIS A SEASON TO BE JOLLY! I am back on the gig circuit and it's going be a fun month to cap off the year. Taco Tuesday on the 6th and among the featured acts on 12th. 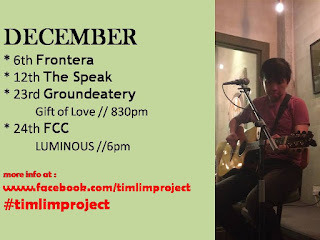 Closer to Christmas, I will be performing at Groundeatery with my fellow #heartcore family, Kent Sim and RELENT to spread some Christmas joy. Christmas eve will be a massive event with FCC, an event like no other where you have food, fun, music and message, all in the spirit of Christmas. There might be minor appearance in here and there (well, since it's Christmas) so you need to stay tuned to my Facebook page for the updates. so.. see you at these events ya! !